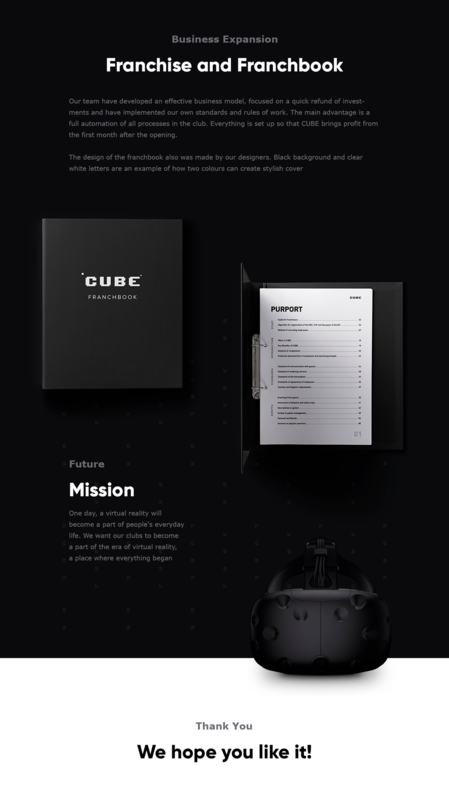 CUBE is a completely new format in the entertainment industry based on virtual reality technology, where people can experience unforgettable moments with their friends. At the entrance guests are met by Motveich, a guide to virtual reality. There are special headset and hand controllers for each player in our club. 1-4 people can simultaneously connect to the system, after that they immerse into virtual environment. There is an individual zone for every person (about 9 m²) where all their movements are read by sensors. These sensors work together by measuring the user’s motions and direction in space. So that our guests can interact with each other. Virtual reality requires as many of our senses as possible to be simulated. These senses include vision (visual), hearing (aural), touch (haptic), and more. You can alight on the deck of a sunken ship and meet the biggest creature in the ocean - big blue whale. You can take a bow and kill hordes of orcs in the epic town defense game. You can become the adrenaline-charged heroes of your own futuristic techno thriller. Moreover you can go skiing on the most dangerous and the snowiest slopes or you can walk on the bar at a height of the 30th floor, trying to keep balance, and then jump down. These and many other games you can try in CUBE. It may sound banal, but the idea of creating such a place appeared from the desire “to do better”. 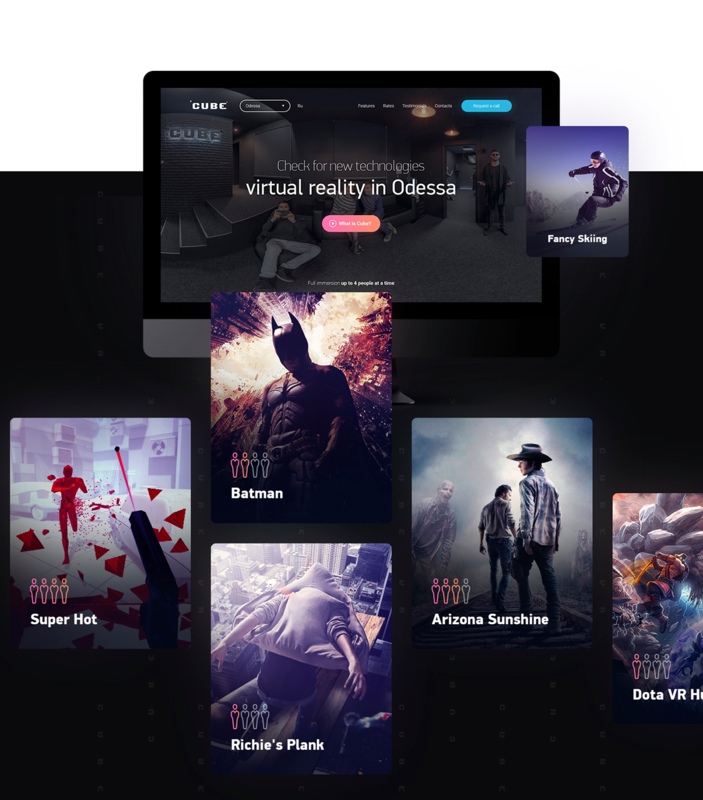 Owners tried what the virtual reality is for the first time in Odessa club of virtual reality that was only one in this city, maybe even in Ukraine (autumn 2016). They was excited about the HTC Vive technology but the club left much to be desired. 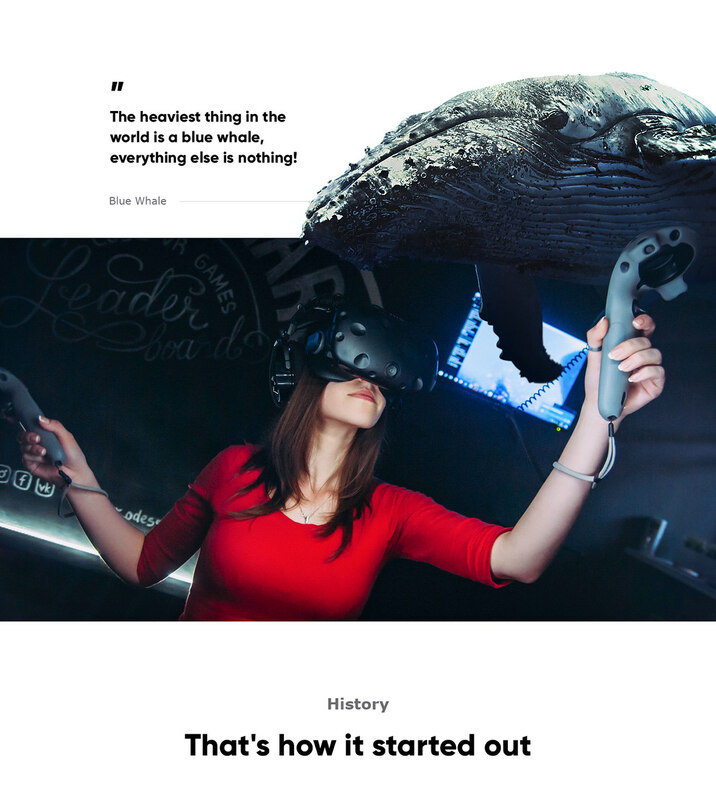 So that they decided to open own virtual reality club with the unique concept. They wanted to introduce the new technology in an interesting way. The idea with the name came up during the installation and the testing of the first set of HTC Vive. HTC Vive shows a blue grid that surrounds you on all sides (as cube). 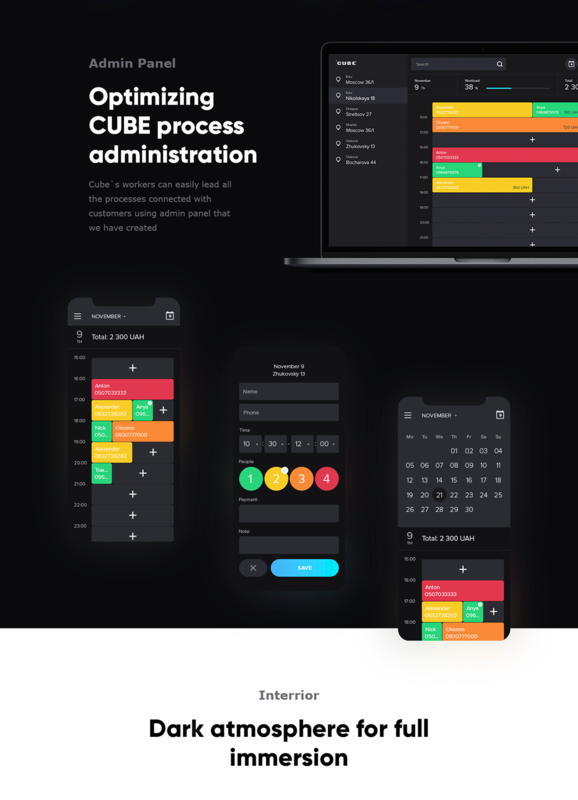 In such a way the name CUBE was appeared. And of course we couldn't forget about one of the most popular films about virtual reality - the Matrix. After having seen this film, we understood that CUBE needed a guide to the virtual reality world, and Morfius became the prototype, but as our character is a jolly parody, we gave him the name Motveich ( exactly with the letter “O”, MOtveich, author's idea), as in the Goblin parody of the Matrix, and the famous leather cloak was changed to a modern black robe. We decided to do the club private, so to get inside you must say the password. And the password needs to be found out. 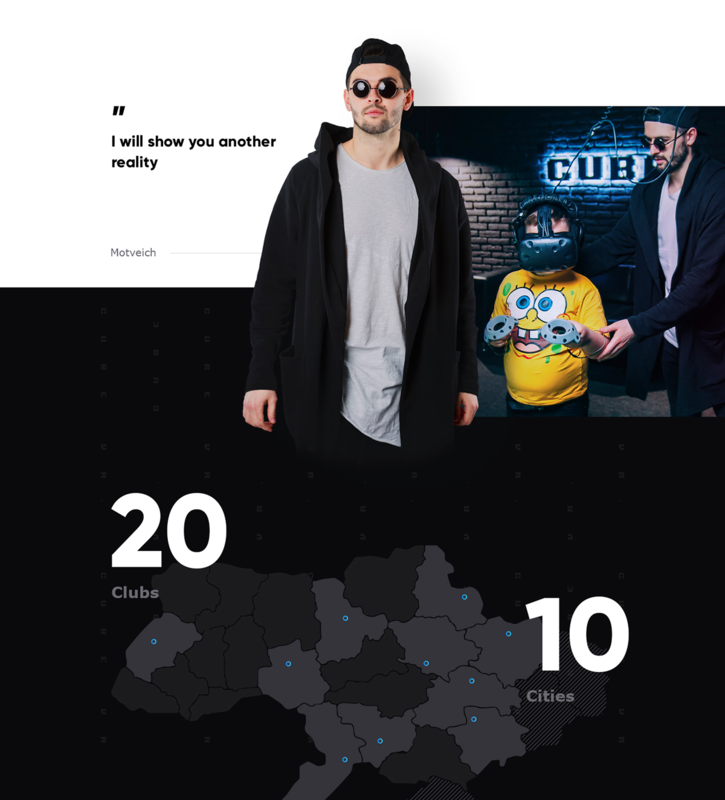 You can find it on CUBE social networks or ask your friends who had already been at the club. We developed an effective high converting landing page. We had a clear understanding of the future website purposes, and the target audience. That's why there were no serious problems in defining the concept. The main goal was to convey the atmosphere of the immersion into virtual reality. The virtual reality was unknown to our designers. So they came to the club and tried what it is. 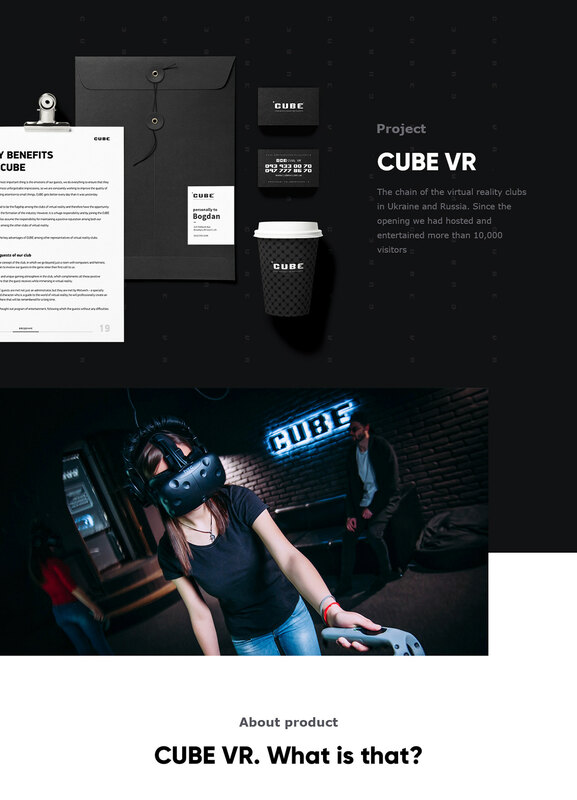 Due to the fact that the club is completely black and the process of immersion into virtual reality looks like isolation from the outside world (you put on headset that keeps the light out and headphones that transmit only sounds from a game) we decided to use dark colors in design. The virtual reality, unlike video games, is a three-dimensional computer generated environment. We added some real objects that stand out against the flat background of the website. (Motveich, sea creatures and space objects). Dark palette of colours promotes the full immersion. Black walls, black floor, black sofa, black TV sets and even black ceiling. Workers are also wearing black clothes. So you can play the most colorful games in the darkest place.